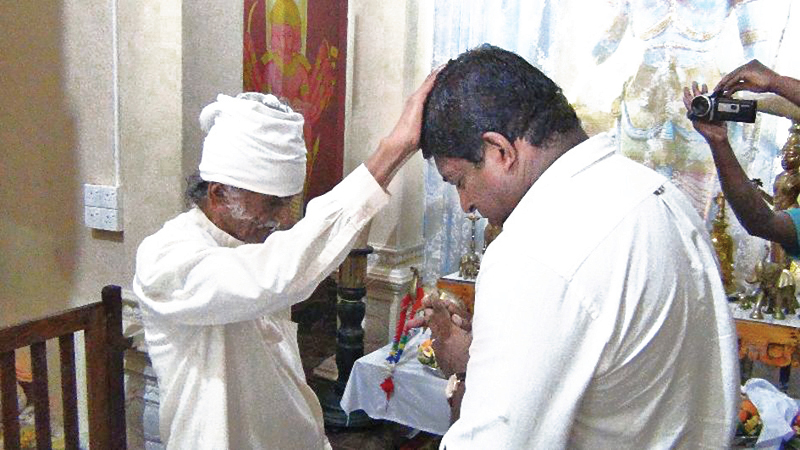 Minister Ravi Karunanayake receiving blessings. Power and Energy Minister Ravi Karunanayake yesterday assured an uninterrupted power supply from yesterday. Minister Karunanayake made these observations while participating in a religious event at the Saman Devalaya, Maskeliya in Maussakele. Minister Karunanayake pointed out that there is a demand-supply incompatibility which resulted in the current power shortage. He further said that the Ceylon Electricity Board has already launched short-term and medium-term projects to stabilise power supply in the country. Minister Karunanayake stressed the importance of generating electricity at the lowest cost. The Deputy General Manager of Laxapana hydropower complex and other top officials participated in the event as well.